Abstract: Vehicle customers now expect a high level of refinement. This coupled with other market trends presents many challenges for NVH (Noise, Vibration, and Harshness) Engineers. CAE is widely recognised as an essential part of the NVH design process. However, methods and procedures must be continually reviewed and developed if design and business challenges are to be met. The role of dedicated tools for model assembly, analysis/optimisation and post processing, together with subjective assessment of CAE results are discussed. The study illustrates that current industry standard automotive simulation methods require development in order to capture the physical properties that are present in real vehicles. The inclusion of such effects as metal forming, bolt preload, contact, and acoustic trim porous materials are shown to significantly change NVH predictions compared to current modelling practises. 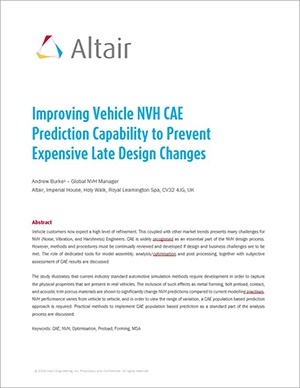 NVH performance varies from vehicle to vehicle, and in order to view the range of variation, a CAE population based prediction approach is required. Practical methods to implement CAE population based prediction as a standard part of the analysis process are discussed.